One of the primary reasons people are talking about Melania Trump's decision not to wear a headscarf in Saudi Arabia is because of Donald Trump's tweet. In January 2015, Trump tweeted criticism of Michelle Obama for not wearing a headscarf during her trip to Saudi Arabia with then-President Obama. 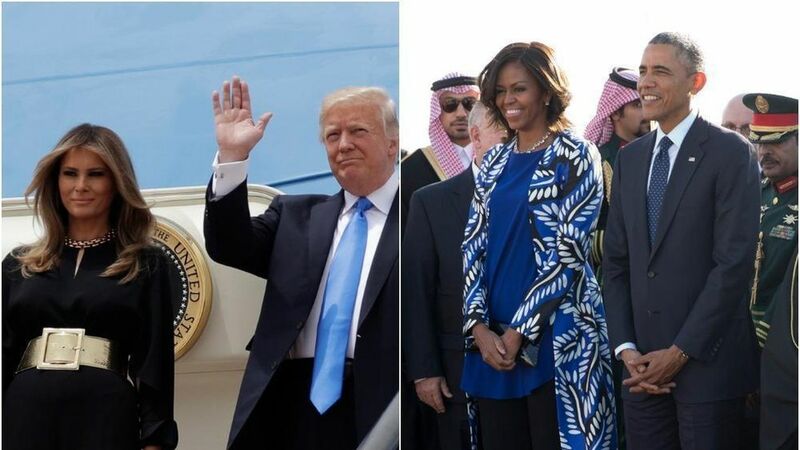 "Many people are saying it was wonderful that Mrs. Obama refused to wear a scarf in Saudi Arabia, but they were insulted. We have enuf enemies," he wrote, suggesting that Michelle's decision to forgo a headscarf was so controversial it would make an enemy of Saudi Arabia. Today, Melania was noticeably not wearing a headscarf during his visit to Saudi Arabia with Trump, but there's no backlash from the president this time around. Perhaps because he realized that most Western women (including past First Ladies Obama and Hillary Clinton) have gone without the scarf, as head coverings aren't required for foreign visitors, AP points out. While headscarves are the standard among Saudi women, the only dress code for female visitors to follow is wearing a loose, black robe known as an abaya, while in public. Melania followed that with a Western interpretation of the abaya — an all-black pantsuit. Bottom line: Trump is still controlling the media narrative surrounding his Saudi Arabia trip, even without making public remarks. His controversial tweet from the past has reminded people of his hypocritical views on Western women, particularly the First Lady, wearing a headscarf in Saudi Arabia .